When I have days that aren’t so hot, my first choice for consolation is a Dean & Deluca almond cupcake. Depending on the day, that could either be paired with a venti black Starbucks or a bottle of Prosecco. Second runner up to the delicious, ego-healing powers of the D&D cupcake would be a Twix bar. Or M & M’s. Or Snickers. It just so happens that the stars have indeed aligned and the geniuses at Mars have packaged all of my favorites into one V-day, fun-filled bag. I threw one of these little dandies into my shopping cart while at the Teeter to bring back to the office. 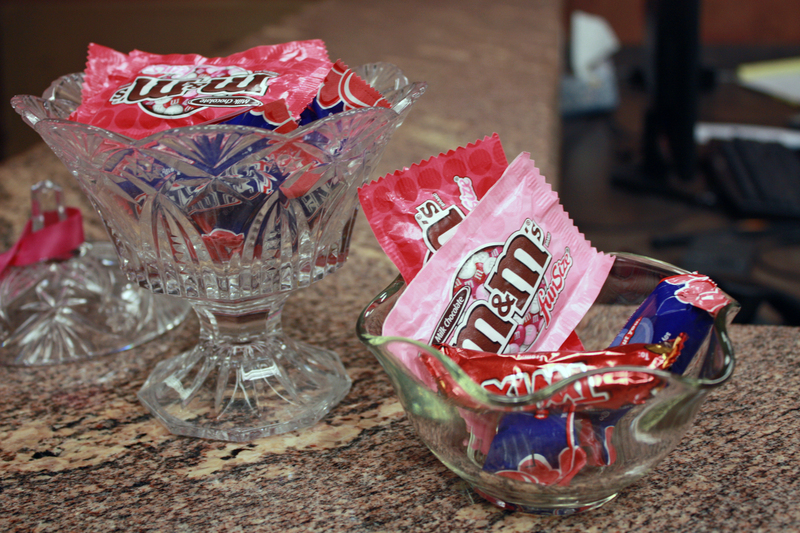 Judging from the candy dishes that were half empty within half an hour, I’d say the co-workers enjoyed being niced. I was wondering where that came from! Thanks!